I’m not able to blog regularly at here because I’m not baking as often as I used to. So no recipes, no blogging. On the contrary, I have tried and am trying so many healthy vegetarian recipes and have been taking pictures and somehow don’t find the time to blog about it here. 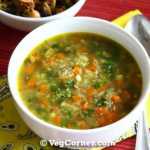 I have about 20 recipes to share, out of which 10 are amazing soup recipes. Initially I thought of doing 2 posts here every week, on Mondays and Fridays and 1 post every Wednesday in EgglessCooking. It’s still in the paper though. I don’t know what I’m doing wrong because I’m always, cooking, washing or doing the laundry and running to the grocery store and other errands. I sincerely applaud all working women who are doing a great job managing both work and home. Hopefully, I can put my head together and get a grip on my schedule. 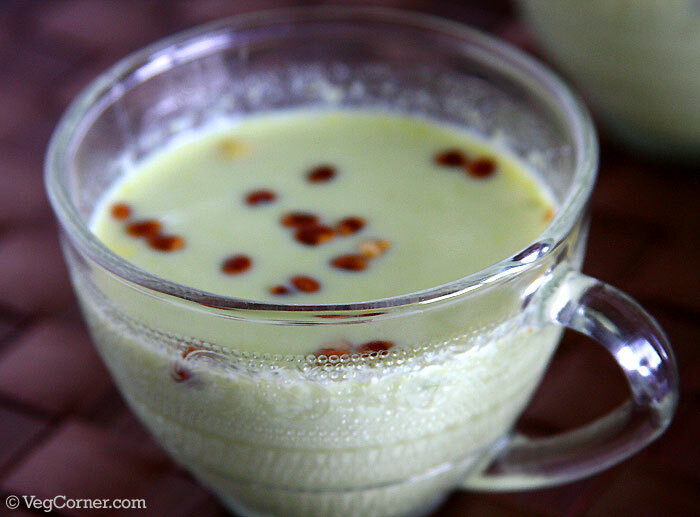 Today I’m going to share a kheer (payasam) recipe using green peas. Even though I have other recipes which I tried before this one, I’m posting this to take part in Priya’s Cooking With Peas event. Over the past 3 years she has extended her unconditional support by sending numerous baking recipes to the events I have conducted. Although I can never match her contribution in quantity because she is so quick and energetic cooking/baking recipe after recipe, I send this unique recipe to her event. I came across this recipe in a Tamil magazine but have changed it quite a bit to make it even richer and better. As unusual as it sounds to prepare kheer out of green peas, surprisingly it tastes mega-delicious. It tastes nothing like green peas, but much like almond kheer. Now tell me who will not like it? Of course, it has to taste good with all the whole milk, pistachios and sugar. No wonder! I’m not calling this a healthy dessert but definitely a different kheer to the usual carrot, pumpkin, rice kheers we are used to. While you are in the mood to try a different kheer, give this ridge gourd kheer a chance too and you would be blown away. Serve this gorgeous green peas kheer in your next potluck and be prepared with a notepad to write out the recipe and to accept the lovely compliments you will be getting all day. If using the pistachios, soak them in warm water for at least 15 minutes. After that, you will be able to remove the skin easily. While the pistachios are soaking you can start the process for preparing the kheer by heating the milk and cooking the green peas. Heat the milk in a saucepan and see that it does not boil over or get burnt. Keep stirring it quite often. Place the saffron strands in a small cup and add a couple of spoons of the hot milk and set aside. 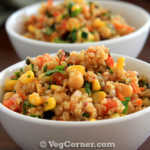 Cook the green peas either in a pressure cooker, microwave oven or stove top. I used a pressure cooker because I was cooking rice anyhow, so placed the green peas in a plate above the rice. Once the cooked peas are cool completely, blend it in an Indian mixer or food processor with the blanched pistachios, into a smooth puree. If doing the garnish, heat the ghee in a small frying pan and once it is hot add the charoli seeds and fry until it turns golden brown. Take care to see that it doesn’t burn. Remove the fried seeds using a spoon and keep it in a plate. 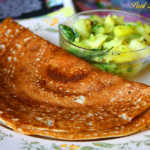 Then add the other 1/2 tablespoon ghee and fry the green peas puree for a couple of minutes to get rid of the raw smell. Once you have fried it enough, add this paste to the boiling milk and keep stirring until all the lumps dissolve. Let the peas mixture cook in the milk for another 5 -7 minutes. 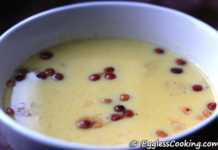 Now add the saffron milk (it would have turned yellowish now), squeezing the saffron with your fingers and the cardamom powder to the milk. Switch off the stove. Add the sugar and keep stirring it a couple of times. The sugar will melt from the heat of the milk itself. 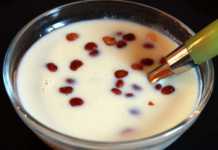 Add the fried charoli seeds to the kheer and mix it well. Green Peas kheer is ready now. Serve it hot or cold. 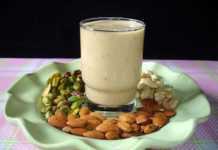 Adding pistachios was my idea and it is optional, but I can say with confidence that it made the kheer extra-ordinary. Use 3/4th cup of sugar first, taste the kheer and add some more if you want it. Be sure to fry the charoli seeds in ghee before adding it to anything, because un-roasted seeds tend to be bitter. Kheer with peas is really new to me. 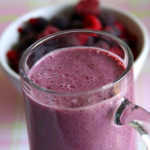 lovely color it has got.. must try !! Thanks a ton for ur kind words Madhu,am honoured dear, Kheer with greenpeas looks extremely delicious,pulling me to try them soon..Thanks again for sending to my event..
It’s my pleasure Priya. I’ll see if I can send something else too.